Bathrooms are typically the smallest and most frequently used rooms in your home, and as a result, clutter will begin to build up over time. Additional storage should be one of the priorities of your design project, and Better Homes and Gardens has a number of attractive projects that could work beautifully in your washroom. While you could opt for a medicine cabinet or another wall-mounted piece, you can add visual interest to your bathroom by using mirrored storage around either side of your bathroom vanity. Head off to a big box store and invest in two large storage towers that can hold towels, soaps and other toiletries, but also hold space for small baskets and other accents. Instead of installing towel racks, consider using an old coat rack in a bare corner. Repurposing items has become an extremely popular facet of interior design, and this can be an intriguing addition that will save wall space for artwork or other accents. 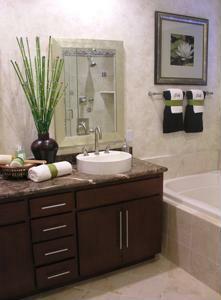 Storage is always a huge consideration in bathroom design, so what tips and tricks do you have for amateur decorators?